The Red Rose of Lancaster (a rose gules) is the county flower of Lancashire. The exact species or cultivar which the red rose relates to is uncertain, but it is thought to be Rosa gallica officinalis. The rose was first adopted as an heraldic device by the first Earl of Lancaster. It was one of the badges of Henry IV of England, the first king of the House of Lancaster. 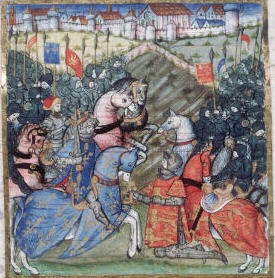 Following the Battle of Bosworth Field in 1485, it became the emblem of Lancashire. Lancaster's Red Rose (also known as Apothecary's Rose, Old Red Damask and Rose of Provins) is an official variety and is possibly the first cultivated rose. The rose grew wild throughout Central Asia and was discovered by the ancient Persians and Egyptians. Later adopted by the Romans, who introduced it to Gaul (France) where it assumed the name Rosa gallica. It is documented that Charlemagne's court exploited the rose as a perfume. The rose was also appreciated for its medical value and was utilized in countless medical remedies. The Red Rose of Lancaster derives from the gold rose badge of Edward I of England. Other members of his family used variants of the royal badge, with the king's brother, the Earl of Lancaster, using a red rose. 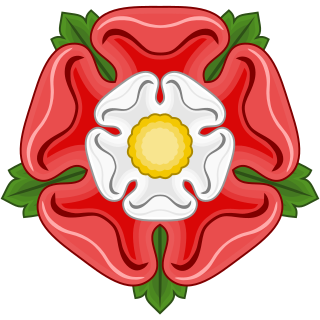 It is believed that the Red Rose of Lancaster was the House of Lancaster's badge during the Wars of the Roses. Evidence for this "wearing of the rose" includes land tenure records requiring service of a red rose yearly for a manor held directly from Henry VI of England. There are, however, doubts as to whether the red rose was actually an emblem taken up by the Lancastrians during the Wars of the Roses. Adrian Ailes has noted that the red rose “probably owes its popular usage to Henry VII quickly responding to the pre-existing Yorkist white rose in an age when signs and symbols could speak louder than words." It also allowed Henry to invent and exploit his most famous heraldic device, the Tudor Rose, combining the so-called Lancastrian red rose and the White Rose of York. This floral union neatly symbolised the restoration of peace and harmony and his marriage in January 1486 to Elizabeth of York. It was a brilliant piece of simple heraldic propaganda.” The Tudor Rose is used as the plant badge of England (Scotland uses the thistle, Ireland uses the shamrock, and Wales uses the leek). The rose does not form any part of the insignia of the Duchy of Lancaster, but came to be seen as an emblem of the county of Lancashire, and as such was incorporated in the coats of arms of numerous Lancashire local authorities including the county council. Since 1974 a number of metropolitan boroughs in Greater Manchester and Merseyside have included red roses in their armorial bearings to show their formation from parts of Lancashire. It is also present in the crest of the coat of arms of the London Borough of Enfield. The traditional Lancashire flag, a red rose on a white field, was never officially registered with the Flag Institute and when this was attempted it was found that this flag had been registered by the town of Montrose, Scotland. As two flags of the same design can not be registered, Lancashire’s official flag is now registered as a red rose on a yellow field. The shield of Lancashire County Council's coat of arms, however, displays not one but three red roses, on gold piles on a red background. The arms have been official since 1903. From the nineteenth century the red rose was part of the badge of a number of units of the British Army recruiting in the county. In World War I the rose was worn by British 55th (West Lancashire) Division during their campaign in Belgium; their motto was "They win or die, who wear the Rose of Lancaster". The cap badge of the Duke of Lancaster's Regiment, formed in 2006, features the rose. The Saskatoon Light Infantry of the Canadian Army also incorporated the red rose into the design of their cap badge and regimental buttons, due to an alliance with the York and Lancaster Regiment of the British Army. The Canadian city of Montreal has a Lancastrian rose in the top right hand corner of its flag, representing the city's historical English community. The U.S. City of Lancaster, Pennsylvania, known as "Red Rose City", uses the Lancastrian rose as its seal, and in its flag. ^ Henry Bedingfeld and Peter Gwynn-Jones, Heraldry, Chartwell Books, 1993, page 130. ^ Henry Bedingfeld and Peter Gwynn-Jones, Heraldry, Chartwell Books, 1993, page 127. ^ Adrian Ailes, “Heraldry in Medieval England: Symbols of Politics and Propaganda,” in Heraldry, Pageantry, and Social Display in Medieval England, ed. Peter Cross and Maurice Keen (Woodbridge, Suffolk: Boydell, 2002), 83-104 (101). ^ "UK Flag Institute". The Flag Institute. Retrieved April 8, 2017. ^ "Lancashire flag is all yellow". Johnston Publishing Ltd. July 29, 2008. Retrieved May 11, 2017. ^ "Manchester City's new club badge design leaked online". BBC News. 24 December 2015. Retrieved 26 May 2017. ^ Nolan, Mike (February 21, 2010). "The coat of arms". 125 by 125. 125 posts from the archives right through to Edge Hill's 125th year. Retrieved May 26, 2017. ^ "Lancashire". Heraldry of the World. Retrieved 20 March 2018. 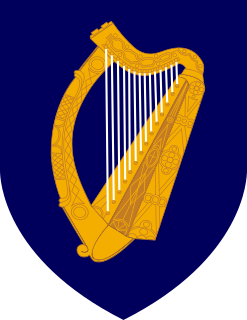 A coat of arms is a heraldic visual design on an escutcheon, surcoat, or tabard. The coat of arms on an escutcheon forms the central element of the full heraldic achievement which in its whole consists of shield, supporters, crest, and motto. 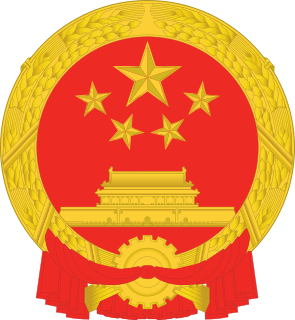 A coat of arms is traditionally unique to an individual person, family, state, organization or corporation. The Pantheon is a mythical or imaginary creature used in heraldry, particularly in Britain. It appears to have been first adopted in English coats of arms in the early Tudor period, subsequently becoming part of the design repertoire of the heralds in their official grants of arms. Early sightings of the creature include the pantheon crests of the Gloucestershire knight Sir Christopher Baynham and his Cornish contemporary John Skewys. Two pantheons appear from the 1530s as the supporters of the arms of the Paulet or Powlett Marquesses of Winchester, though at a later date they were reinterpreted as the hinds or female deer they can closely resemble. In 1556 a coat of arms with three pantheons on the shield was granted to Henry Northey of Bocking in Essex. The City of Manchester in North-West England has traditionally been represented by various symbols. Most of these symbols are derived from heraldic emblems contained within the city's official heraldic achievement, which was officially adopted when the Borough of Manchester was granted city status in 1842. Notably, the motif of the worker bee has been widely used to represent the city as a symbol of industry. The coat of arms of Lancaster University is the official emblem of Lancaster University, in Lancashire, England. It was granted to the university by Royal Charter on its establishment in 1964.